How can I be sure an email is deliverable? 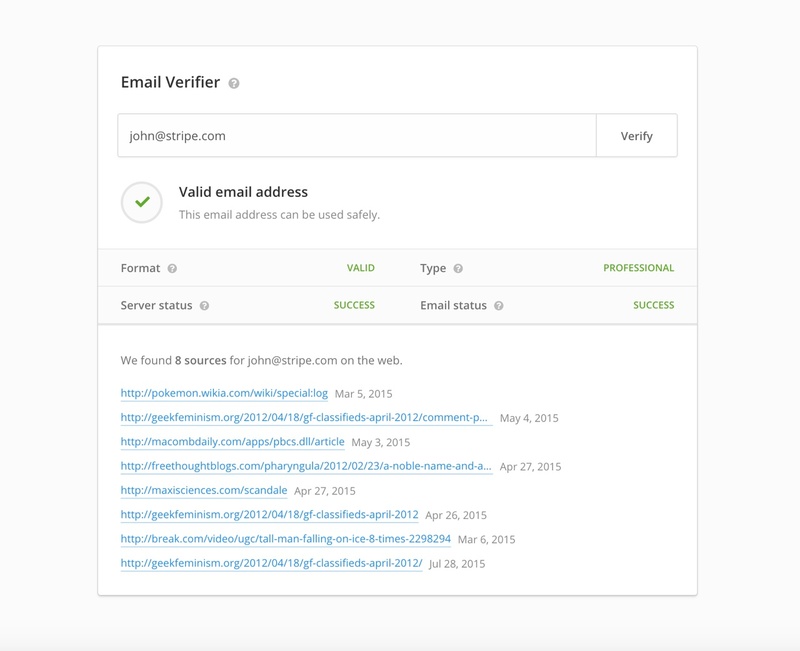 Running the emails that are gathered in Hunter or from other sources through the Email Verification functionality will give you an accurate indication of the deliverability status of the email. The Email Verification can provide you different results. Deliverable: it means every information we got regarding the email was fine as it passed all our verification checks. Risky: in this case Hunter can't be certain about the deliverability of the email, and, because of some factors we fear it could bounce. Invalid: the email did not pass one or more checks in the email verification and it is not deliverable. What checks are performed with the email verification? Format: we verify the format of the email address is correct and looks something like "email@provider.com". We also ensure the address doesn't look like a random email address. For example, 1e49cs1pb6@company.comwill won't pass the test. Type: We check if the email address has a domain name used for temporary email addresses and we also verify if the email address uses a webmail like Gmail or Yahoo. Server Status: We check if there are MX records on the domain. If there aren't, the email address can't receive emails. We also perform a SMTP check to see if we are able to connect to the SMTP server (indicated in MX records). Email Status: We test the email address and see if it bounces or not and we check if the server has a catch-all policy which accepts all the email addresses. The checks for the format, type, sever status and email status passed. A deliverable email can also provide sources where it can be found on the web. When an email address is tagged "risky", it means the verification check seems to work, but we have reason to believe the email may not be read by anyone. The most common cause for a Risky email address are Accept-all domains. 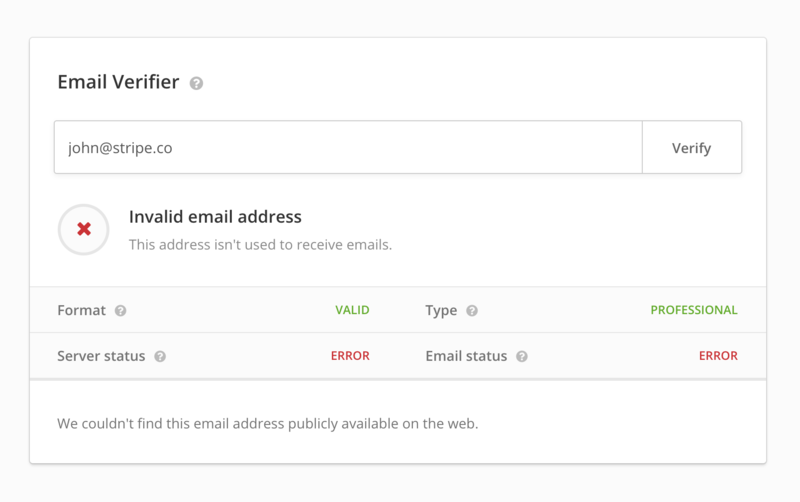 Accept all domains are basically domains that are set up to accept all emails and, due to this we mark them in the verification section. For example, in this case the domain “hunter.io” is one of these types of domains. So, if we check anything@hunter.io we will always receive an “OK” response for any mailbox. This is why we cannot be sure the emails associated with them are valid. In this case both the server and email status failed for the email, meaning the email will certainly bounce as it does not exist. 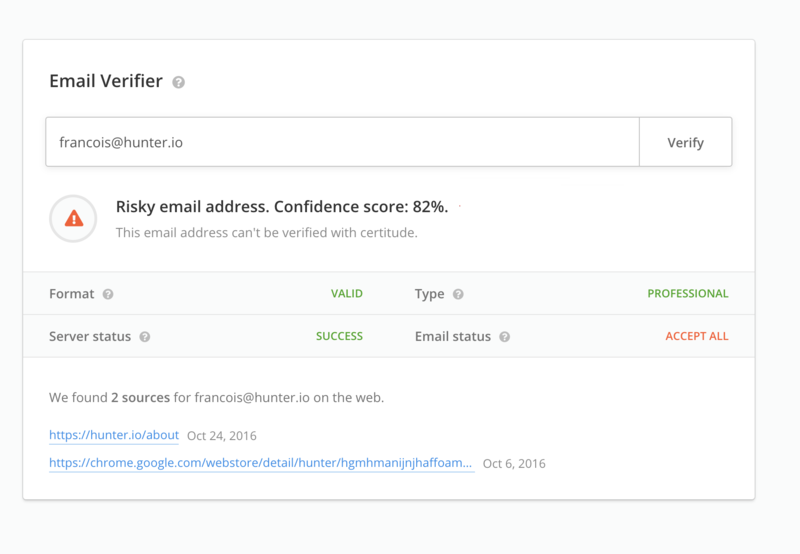 All the emails found in Hunter have a confidence score assigned which will provide you with a first overview of the "faith" an email will have. Simply hover the dot next to the emails found in the domain search to reveal the confidence score. Email addresses with a confidence score of 90-95% or higher have a high chance of being fully deliverable although a high score does not guarantee a 100% fully deliverable email. Providing an accurate and updated confidence score is our first priority: confidence scores are constantly updated to reflect the emails' deliverability. To have a complete deliverability report we highly suggest running the emails that are gathered through the Email Verifier tool.